Would there be any way to downscale the quality of the reflection to a degree? Having full quality reflection is nice but the performance cost halves my framerate around Tali. yes please do a low d option someday so people who don't have a supercomputer can use it, otherwise great mod. so a gtx 1080 drops down to 35 fps form 165 fps. that's not a slight decrease. Does it work with the 'Tali alternate casual outfit' mod? It is not compatible unfortunately. It might be possible to make it compatible though. 1. Using ME3Explorer 3, open up the Tali_from_Ashes_as_casual_meshes.mod in modmaker to install it, say yes to upgrade. Then click run all in the upper left. I downloaded it and saw that it worked. Looks really nice, but holy framedrop batman! I have a pretty damn good computer that can run Witcher 3 on high - ultra... but my frames drop from 60 (max) to 23 when i'm near Tali. I like the idea... i really do, but this just makes me refuse to use Tali in any mission. Sorry.... thumbs up for the idea.... but the framedrop is too massive for this. EDIT: i also have a few other texture mods installed like A Lot Of Textures, but this should not affect it that much. Wow, impressive! I'm gonna download this at some point! 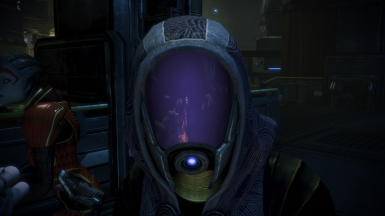 To make it more immersive, maybe you should include this for all quarians. Getting a lot of Tali love this month :D Awesome work on this! what an awesome idea! endorsed!